Over 36 hours now since I returned to London following 3 weeks in Jamaica. I am missing the island already! But no pity for me dear reader as I was also there in May and June. The main purpose of the trip was to attend my Aunty Ruby’s funeral on 2 September, day after I landed there, in Spanish Town. Aunty had lived to the ripe old age of 90 and when I last saw her alive on June 23 I promised that I would see her again in October or for Christmas. Sadly that moment will not happen but there was no way I would have missed her funeral. She was my dad’s older sister by 2 years and given Dad had lost my mum 12 months ago I wanted to be there for him also. Aunty Ruby was such a character. She was a “to the point” person. She lived life a full spead, worked hard and was always gave me a bottle of Sonatagen Tonic Wine whenever she visited our home in Old Harbour. I developed a passion for one of her favourite hobbies. Photography. Aunty had pictures going right back to the 1950s and last year she showed me a picture of my parents’ wedding in 1954 (Mum and Dad were together since 1948). Quite a moment for me as this was the earliest photo of my dad that I had seen. In his white suit! Wicked and styleee. I am certain Auntie Ruby had a giggle up there at funeral. While I was on pall bearing duties and helping to take her casket to the hearse from the church for burial, my trousers decided to have mega split bang in the lower regions. I was (and still) hoping no one noticed and headed home quickly to Old Harbour for a quick change. No one has mentioned the pall bearing splits to me since so I am hoping its has avoided being you tubed! One of the great features of Jamaican funerals is the post burial festivities which means one word. Food! For Aunties funeral ,which had over 150 friends and family in attendance, this was like a feeding of the 5000. Reason being the funeral organisers (cousins) had forgotten to cancel one of the 2 caterers. So both turned up with deelish food. There was so much food on show that even complete strangers sneaked in to get some box grub and headed back to their homes. Big shout to my cousin Judith Jarrett for arranging an excellent funeral programme for Aunty Ruby. Aunty would have been proud of Judith’s efforts. The rest of the 3 weeks in Jamaica was fair mix of pleasure and business. Chilling with my dad and other family, catching up with old friends and taking the next steps on a number of property related projected. In between I found time to do some career development coaching to a few young folks in Old Harbour. All very rewarding for the soul and it definitely convinced me that there is a lot I of support can offer the community of Old Harbour. I intend to pursue this avenue full time. Sitting with my Dad in the backyard and learning more of about his early life is when I am at my happiest. For example I never knew he had worked in Wisconsin, USA, back in the 1950s. Dad also mentioned that Usain Bolt’S paternal grandfather and grand uncle were some of his childhood chums. The secondary school football in Jamaica had just started and I watched a couple of games hosted by the local high school in Old Harbour. The coverage and publicity that schoolboy receives here is huge and equates to the UK media report the English Premiership. No joke and I find the coverage a bit ott. Even more disturbing about school boy football in Jamaica is that these teenagers are sometimes expected to play up to 4 matches in 8 days! Add to that the intense training these players endure during the summer it is not surprising that a high number of these teenagers fail to fulfill their academic potential. The fruit and vegs in our backyard were in full swing. I loved eating roast breadfruit, ackee and my daily drink of coconut water. I always say if you live in Jamaica and got some space to plant things you will never go hungry. 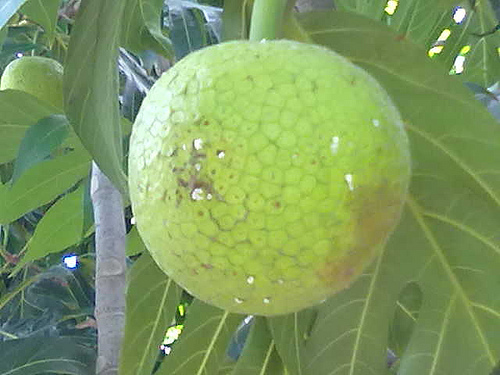 Breadfruit which can be roasted on a coal stove. Some then fry it. As I said my goodbyes to my family I knew this would be the very last time I could leave Jamaica like this. It is the place I call home. Over the past 2 years I have seen my Dad and sister more times than any of my friends and family in the UK. There is a life to live out there in Jamaica. The politics and crime there can be too much to bear at times. But I feel happiest in Jamaica with family, developing my business plans and not having a worry in the world. The funniest thing I saw on Jamaican television was this clip from the Ity and Fancy Cat show. Enjoy. 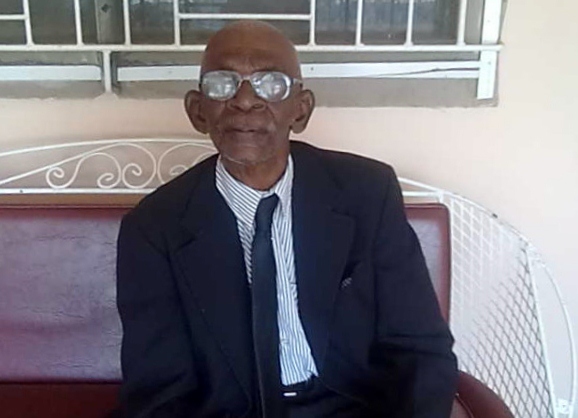 This entry was posted in Uncategorized and tagged gary lewis, jamaica. Bookmark the permalink.